As many know the T43, T43p, X41, X41T, and R52 (I think?) all have an internal Marvell 88SA8040 PATA-to-SATA bridge chip inside, which allows the use of PATA disks inside the drive bay. That was great in the mid-2000s I'm sure, but I think we've all grown tired of that by now as PATA disks become more expensive and SATA drives become faster and more efficient (especially with SSDs with TRIM support). There has been a mild amount of documentation on users who have performed this on their T43 / T43p laptops, but almost all of the useful information is in german or chinese with inaccessable / broken image links. My goal is to perform the modification based on the much more available information for the X41 laptops, as they use the same chip and the modification should be mostly electronically identical. I intend on documenting the process thoroughly so another user may utilise it. 4) Mount the drive safely. 5) Optional: Install modified BIOS to hide the 2010 error (should it still come up). 11:11 / 23:11 UPDATE! This picture says everything I want it to. Once I've properly mounted the cables and drive, it's time to move on to power. When this is done I intend on exhaustively explaining it so others may do the same. Before I do any soldering or modification to my motherboard's planar, I have done some research and come up with the following diagrams. This one I am sure of the accuracy. Optionally pin #11 may be used for drive access indicators. This one is what I need clarification or confirmation on. I am almost 100% sure these are the correct 4 pins to use (27, 28, 31, 32) but do not know if I have the correct data lines going to each one. The good news is that, unlike the X41, the T43/T43p has big, easy test pads going to each of these four lines, making the actual wire soldering much easier (You can stick the wire through the hole even for a more stable connection from what I can tell). Based on additional research it looks like I was nearly correct except that my A lines are swapped. I may test this later. The Korean link I provided in the quote block below has been immensely useful. If I was accurate enough to resolder should I screw up, I would temporarily cut the four traces for these data lines and observe if the drive disappears from the BIOS. If anyone has any input it would be greatly appreciated. I believe I can simply cut the Marvell Chip's SATA data lines and solder in my own without any issues, so if anyone knows the correct pinout I can do that ASAP. Last edited by Bibin on Tue Feb 22, 2011 11:33 pm, edited 5 times in total. It looked as there were many useful attached images but I could not view them without registration. This confirms what the Korean site said; that I had a few pins mixed up, but found the right pins. I'll try to go about cutting the traces and soldering tonight if I can. If I mess up, I guess I am out one motherboard :/ If anyone knows any useful contact points on the T43 motherboard that would be very helpful as the little QFP package is tough to solder to and I do not have the equipment to remove it. Last edited by Bibin on Tue Feb 22, 2011 7:17 pm, edited 1 time in total. 1. Is it possible to keep the Marvell chip on place and only bypass it (solder sata wires before its inputs)? 2. Do you keep internal IDE connector on the place? 3. If answer for the first question is 'no', how to safely unsolder Marvell chip? Only safe way to unsolder the chip is to use heat gun with controllable temperature or soldering station. For the hobbyist the 1st option is the only reasonable way to go and you can borrow the correct heat gun from local tool rental. Prior to jumping on the T43 board, try the unsoldering on some junk PCB which has SMD IC-s to get the feel of the work. It doesn't take long nor it is dangerous if you are careful and not rushing. It takes around 30 seconds to minute (depending on temperature of blown air, ambient temp etc) to get the chip and flux heated enough so the chip becomes loose. One should not use any force when removing the chip, it should come off easily. I have used 370 degrees Celsius on the heat gun for removal (results around 250-260 on the chip) and don't heat more than you need (both time and temp vise). And btw, the only correct way (and the easiest) is to remove the chip not cut the traces. You can solder the chip back if you want to use PATA HDD again but patching cut traces is extremely painful and makes a mess of your board. So you were off by 2 pins in the Marvell chip? Not too bad for some guess work. Here's my question. Have you considered replacing the internal IDE connector with a female SATA connector to allow for simple insertion and removal of SATA drives instead of hard wiring them into the system? Other than that, thanks for your work in converting the german and chinese sites into english and providing good documentation for the community here to work with. Pin 1 is on the bottom left, then goes to the right, then up, then left, and then down. Last edited by RealBlackStuff on Sun Feb 20, 2011 12:18 pm, edited 1 time in total. Temetka wrote: Have you considered replacing the internal IDE connector with a female SATA connector to allow for simple insertion and removal of SATA drives instead of hard wiring them into the system? AFAIK the SATA mobo connector contacts would overlap those pins of the IDE, which (all 44) are soldered there. A 15" T43 would be ideal, if you drill extra screw holes in the 'legs' of the HD cover. 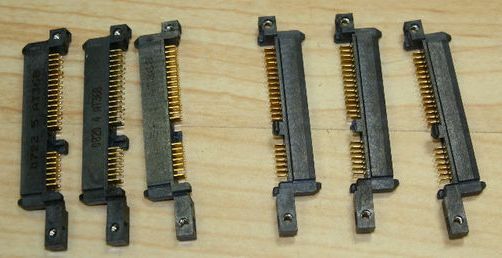 You could then place the SATA connector between the 'old' IDE connector and 'new' SATA HD. I was thinking that especially the Macbook connector might glue to the front of the existing IDE connector and the wires run to the relevant points on the motherboard. Oh Well - maybe it's time to put my money where my mouth is - in for a penny, in for a completely ruined T43! Last edited by poshgeordie on Sun Feb 20, 2011 12:05 pm, edited 2 times in total. I have now done it several times in a 15" T43p. The connector mentioned on thinkpad-forum.de was bought from at.farnell.com in Europe. However I would advise against the above connector. After a few experiments, I found out that the best one is a SATA connector as used in HP DV6000 and DV9000 HP TX1000 and TX2500 laptops. EDIT: Some of these do not have AT368 printed on them! Last edited by RealBlackStuff on Wed Oct 19, 2011 2:03 pm, edited 2 times in total. I did not remove the chip. Rather, using a very sharp small jeweler's screwdriver, I cut the traces going from the marvell chip to the SATA test pads. This leaves a very small area to solder but if you are precise you can do it. If you have the means of desoldering the chip, you should do it. It is easier if you do. I removed the IDE connector so I would have space for the drive and the wires. I ended up soldering to the drive's pins for space concerns; I did it in such a fashion that to remove the solder and make the drive usable in a normal enclosure would be possible. In this way it worked perfectly fine. I removed the IDE connector, but used its power pin which delivers a stable 5V suitable for a 7200RPM 2.5" HDD. I used hot glue to secure the four tiny wires to the pads, and then soldered larger wires to those ones (they are grey ones from an old Floppy cable). I had a 8" run as shown in the picture and had no performance issues, no errors, nothing like that. It was very fast and I was quite happy. I put the drive in the bay, secured it with a few more dabs of hot glue, and closed it all up. Very fast and happy! However, about an hour into reinstalling the Adobe CS4 suite, I could faintly smell some hot glue. The southbridge and Wi-Fi card won't ever get hot enough to completely melt my hot glue, but the few hair-thin strands of glue were likely melting a bit. In a hurry, not wanting to ruin my laptop, I force shutdown the computer (as it wouldn't cancel the install; I simply held the power button). I then took it apart and inspected; all the glue was in order, nothing looked wrong. I put it back together. Now, it won't boot. The BIOS comes up fine, it recognizes the hard drive as WD3200BEKT, and that's not an issue. However, when I try to boot, it simply sits with a line in the corner, and then about 2 minutes later says "A Disk read error has occured." Attempts to boot from a Windows XP Install disc also show a similar line after a second of disk activity. When I tried to boot from a copy of Hiren's Boot CD 10.6, it loaded the initial menu, but when I tried to select an option it just hung. When I desoldered my HDD from the cables, the CDs booted without issues (of course no HDD). I am hoping that my HDD has simply had its partition table messed up, as otherwise it looks as if I'll have to re-solder my SATA connections. No error messages come up from the BIOS. I have tried wiping the CMOS settings to default and also unplugging the battery. NOTE: If you do this mod, and don't hook up a SATA drive, and it says "0200 Error At Fixed Disk 1" that is GOOD. You will only see that error if the Marvell controller is disconnected. If you don't have a drive and don't see that error, then you need to cut the pins. Last edited by Bibin on Sun Feb 20, 2011 3:41 pm, edited 1 time in total. In the 15" that will be perfect. Bibin, do you have some chance to test an SSD HDD and post performance benchmark results? If I'm correct, that SATA connection in T43/R52/X41 running at 1.5 Gbps? And does it mean, if I will do the mod successfully that I will get 0200 error during every boot? I plan to remove the chip completely. edit: could you please test, if Active Protection System works flawlessly? I can tell from my X41 that I modified (has the same chip and the same chipset) that I don't get any errors at startup (no 2010 and no 0200 or whatsoever), I removed the chip. No 2010 BIOS applied also. And APS works OK.
could you preliminary estimate what will be a price for this mod, if I will send you my unclothed T43p (planar with bottom base)? I am from European Union. Thanks. 1) You have a hard drive attached: You should receive no errors on boot. 2) No hard drive is attached: You should receive an error 0200 Fixed Disk 1. I have a Crucial 64GB M225 SSD I can try when I am home. First I have to solve the issue I am dealing with, though. At the moment I don't think either of us could give even an estimated price for doing the modification - and I don't know if RBS would want to do this anyway. I need to give it a go first before I'd think about offering it as a service and I'll keep the forum updated if / when I do try it. I realised I had shorted out the A+ and A- lines to a nearby capacitor - my bad! - when I took it apart, so I'm now re-doing the modification. This time there will be no hot glue and it'll be much neater, using heat shrink tubing for insulation and structure. Much better job this time around. Now I can swap drives easily with no soldering, and it's much neater and more stable. I'm bumping this just to reflect that I've completed a proper, followable writeup to help others who wish to do the same. What's the best method to make the SATA power and data connectors for the hard drive in this mod? And please, someone make a video of this baby running an SSD! Also.. Can this be done with the normal T43? rkan wrote: What's the best method to make the SATA power and data connectors for the hard drive in this mod? I cut all the wires but the red and black ones, as the red wire on a standard PSU is 5V. 2) I put my crucial M225 SSD in there, and it works, but it's not much faster if faster at all than my 7200RPM HDD. SSDs with any windows older than 7 will slowly screw up the SSD over time, and as far as I'm concerned Windows 7 is garbage, especially with the ATI graphics card. 3) Yes, it can. It should be the exact same procedure as outlined in the link in my signature. But the Intel SSD supports trim on XP, and because it's not the fastest SSD, it will be good for the Sata1 anyway. Well, if the TRIM will work in XP then go for it. I can't test one for you since I don't have one. Bibin wrote: Well, if the TRIM will work in XP then go for it. I can't test one for you since I don't have one. Intel has it's own software for XP, which does the TRIM function. Some other manufacturer did this the similiar way.. Cant remember which. Please post HD tune benchmarks using a SATA drive. HD Tune reported about a 124MB/sec read maximum (more consistently around 120) for a crucial M225 SSD, which isn't far off from the speed limit of SATA 1 anyway. Hi, what about HDD LED under LCD display? Is it working with your SATA modification? The HDD LED does not work as the IDE pin is not connected to anything - apparently it is possible to fix this but I don't really care. poshgeordie wrote: I need to give it a go first before I'd think about offering it as a service and I'll keep the forum updated if / when I do try it. I am going to Leeds for a business trip next week, but that was a bit too far away from where you live to stop by and have a pint.